Europe needs to identify sites for long-term storage of nuclear waste, with deep burial underground the best option, the European Commission says. A draft EU directive presented on Wednesday calls for national plans to be drawn up in the next few years, as the EU still has no final storage sites for nuclear waste. Exports of nuclear waste beyond the EU for long-term disposal will be banned. 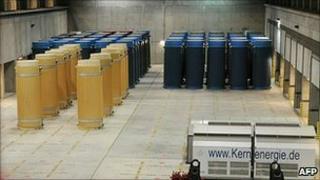 Existing storage sites can be used for 100 years at most, the Commission says. High-level waste from nuclear power plants can take up to a million years to decay. Finland plans to have a long-term waste repository operational in 2020, Sweden in 2023 and France in 2025. Every year the EU produces some 7,000 cu m (247,203 cu ft) of high-level radioactive waste. It is the part of reprocessed spent nuclear fuel that cannot be re-used. "Safety is indivisible. If an accident happens in one country, it can have devastating effects also in others," said EU Energy Commissioner Guenther Oettinger. The Commission says there is a broad scientific consensus that the highly toxic waste is best disposed of deep underground. That solution was recommended by nearly 200 scientists and engineers in a report last year called "Strategic Research Agenda". Fourteen of the EU's 27 member states have nuclear power plants. France, with 58, has by far the largest number. The total number in use in the EU is 143. One of the favoured storage methods is vitrification, where the nuclear waste is dissolved in molten glass, then poured into steel canisters, which are buried. The glass later solidifies, trapping the toxic waste.